The Italian cypress or Cupressus sempervirens is sometimes called the pencil cypress because of its tall, slender shape that comes to a point at the top. 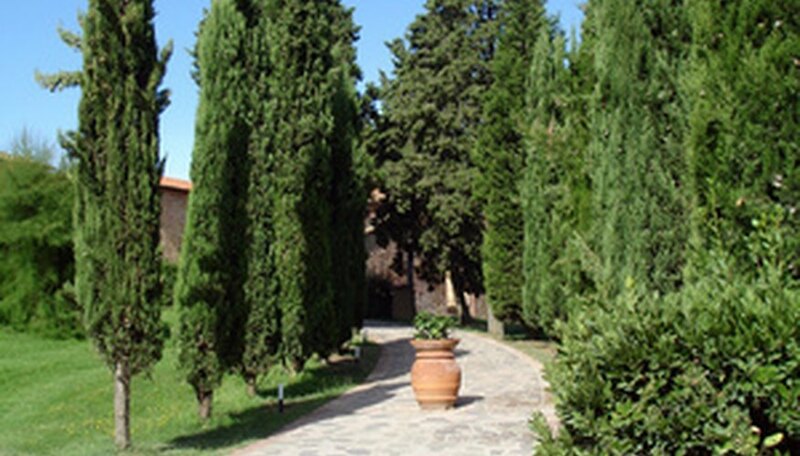 Italian cypress trees are fairly easy to care for and relatively disease free. This makes the Italian cypress desirable in many landscapes. However, being aware of the disease that can affect these gentle giants and how to treat them can save your Italian cypress. The Italian cypress is one of the tallest cypress trees, reaching 40 to 60 feet in height. The trunk seldom exceeds 3 feet in diameter, helping give credence to its “pencil-like” appearance. It grows along the western, southern and the lower half of the eastern coastline of the United States. The Italian cypress is highly drought tolerant and does well in almost any soil type, as long as it is well-drained. Dictionary.com defines disease in a plant as “any abnormal condition in a plant that interferes with its vital physiological processes, caused by pathogenic microorganisms, parasites, unfavorable environmental, genetic or nutritional factors.” Using this broad definition, Italian cypress trees still have relatively few disease issues. Chief among them are cypress canker, root rot, bagworms and spider mites. Beginning in the fine hair-like roots of the Italian cypress tree, root rot turns the roots brown and continues progressing through the main root and into the stem. The vascular system of the tree is affected, leaving the tree without access to food and water. The tree is girdled after some time. Outward signs are the downward curling and wilting of leaves, which can last a long time before death occurs. Cypress canker is a fungal disease that attacks the bark and the inner layer of wood called the cambium. Tissue infected with cypress canker turns pale green and then yellow. The next step is death. Spider mites leave either a dusty appearance on foliage or tiny webbing throughout the affected area of the plant. Bagworms make small cocoons made of the tree’s needles. The larvae eat the needles and can strip the tree of foliage. Severe cases over several years can kill the tree. While spider mites are less harmful, both insects can create situations of declining health for the Italian cypress tree. Spider mites hide in the dust they create so that predators cannot find them. Rinsing the tree with water can remove the dust and expose them. If they continue to be a problem, an application of a miticide should clear up the infestation. Bagworms can be controlled by removing the cocoons or bags by hand in the winter or early spring if there are only a few. If there is a greater presence, then an insecticide should be applied when the larva are small and more susceptible to it, usually in early June. Chemicals to look for on insecticide labels include Acephate, Carbaryl, Azadiractin, Spinosad, Bifenthrin, Cyfluthrin, Gamma-Cyhalothrin or Permethrin. While cypress canker is a fungus, there is no effective treatment that will save affected tissue. The limb must be excised from the tree and destroyed to prevent spores from spreading. If the tree is seriously infected, it is best to remove it completely and destroy it. Avoid planting other cypress trees in the same area for several years. A fungicide applied as a soil drench can treat the roots of an Italian cypress suffering from root rot. It is necessary to use the fungicide in the spring, summer and fall to prevent a recurrence.